When the day of Pentecost had come, they were all together in one place. And suddenly from heaven there came a sound like the rush of a violent wind, and it filled the entire house where they were sitting. Divided tongues, as of fire, appeared among them, and a tongue rested on each of them. All of them were filled with the Holy Spirit and began to speak in other languages, as the Spirit gave them ability. Today is the Christian celebration of Pentecost. It is also called Whitsunday, the Feast of Weeks, and here: Pinksterdag. The Dutch word “pinkster” is actually derived from the ancient Greek pentēkostē, which means “the fiftieth day”: fifty days after Passover, when Moses was on Mt. Sinai, and was told, among other things, how to slaughter meat. But back to Pinksterdag. I was raised Catholic, so the Christian version of Pentecost falls closer to my personal body of knowledge. The apostles, including the newly minted Matthias – Judas’ replacement – and Mary, and about 100 others, and I’m guessing but not sure Mary Magdalene, gathered for the Jewish feast. And the Holy Spirit, who had a tendency to drop in unannounced, crashed the party with flaming tongues. Pentecost is considered the birth of the Christian church, because the Holy Spirit gave everyone there the ability to speak another language. The word of Jesus Christ could spread. Editors are like Jesus. Now bear with me here. We start a literary journal or press and we want it to spread like wildfire. Part of this is pride: we have made something beautiful and enormous. Part of this is economics: we need people to buy our books so that we can make more. And part of this is ego: it is our book we made, it is our work. It must reach as widely as reaching can. Editors are Pentecostal, and so am I. I wanted Versal to go everywhere. Writing from everywhere, to everywhere – circulate and expand, expand and circulate. Economies of scale, without the real economy to back us, but doing our damnedest anyway. And last year, I shut this all down. We were about to open for submissions to Versal 12, the mark of 12 years, the perfectly rounded dozen, the team intact and ready to go, the templated layout in wait, and 11 years of a reputation built to guarantee sales and publicity. A well-oiled literary machine. We could have done it blindfolded, and that’s exactly why I stopped us. As I said on Versal’s blog a few weeks ago, I am baffled, as both an editor and a poet. I am baffled by the numbers and volumes and verbosity of the, especially American, but perhaps more accurately said, Americanized literary world – these magnitudes terrify me in their noise and celebritizing, in their repeated exchange of blows, in their Manifest Destiny proliferation of an already beleaguered economy. I was afraid the masses were drowning Versal. Actually, I am afraid the masses are drowning us all. It is this state of baffled that started and continues Versal's publication sabbatical, because I need some quiet to think. To parse through the overgrowth in the literary world and cut back down to the interior. I have shared this before but I’ll share it again, as it remains relevant to my work as a poet and editor. In college, I had an English professor, Robert Baker, in fact the very professor who had me buy this Bible for his literary criticism class, who taught me that the most valuable poetic line is the one which understands it is being written against the silence of the white page. It is a push of speech, to enunciate in the silence and make sound. The best line knows that sound is a kind of violation, and that silence cannot be broken with just anything. And that brings me to VERSO /. 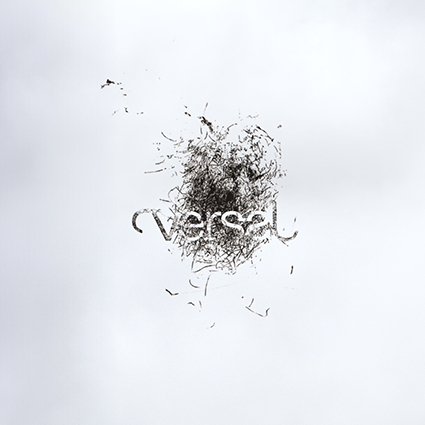 It is Versal’s coming back, after many Pentecostal years, to the city that is its home, to the people who are its community. We hope to present these “live literary journals” to you regularly, with visiting and local writers and artists and thinkers, here at our beloved Mezrab. And this first number of our first volume, appropriately called “Hold Your Tongue”, celebrates the opposite of literary – maybe even human – noise. The opposite of spread and sprawl. The quiet. The edit. VERSO / is the perfect edit. A limited number of beautiful and enormous things coming together in a brief shout in the silence, however rare it may be. I hope you enjoy your evening. Megan M. Garr is the author of The Preservationist Documents (Pilot Books, 2012) and Terrane (MIEL Books, 2015). She is the founder and editor of Versal. Originally from Nashville, Megan now lives in Amsterdam, the Netherlands.